"I don’t think people even knew what to say about it," she said. 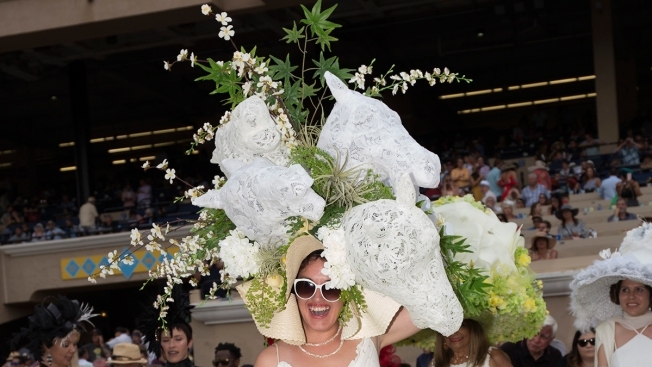 A San Diego County woman who walked away with the coveted grand prize at the 2018 Del Mar Hat Contest worked with an unusual medium - cannabis. Leslie K. Monroy is a designer who has entered the hat contest several times but her amazing creation of horseheads made from lace earned her the grand prize Wednesday. Among the greenery in her hat were several marijuana plant stems. That was no mistake for Monroy who described herself as "the weed girl" in a celebratory post on social media. "Anytime I can use cannabis in anything I'm doing, I always use it. Especially in flower arrangments," Monroy said. She used cannabis as a design element in her hat last year but it didn't garner quite as much attention as this year's prize winner. That's ironic because last year's hat, which she described as "a lot more subdued" compared to this year, featured actual cannabis bud. "People close to me definitely noticed," she said of last year’s cap. The cannabis stems on her 2018 hat poked up into the sky an estimated 3-and-a-half feet. Monroy said the hat weighed in at around seven pounds. "With everything being legal, this year it was more fun to do something way more in your face," she said. More than 300 contestants competed for a total of $6,000 in cash and prizes. Monroy earned a total of $2,000 in prizes, contest officials said, including a one-night stay at the Fairmont Grand Mar and dinner for two at Addison Restaurant. The winning hat for the 2018 contest was worn by Leslie Monroy of Spring Valley. When she's not rocking cannabis-infused hats at Del Mar or Comic-Con, Monroy is putting together floral arrangements for her company Flowers on Flowers, described by Monroy and on its website as "California's first and only medical marijuana florists." Proceeds from Flowers On Flowers benefits Canines for Disabled Kids, an organization that helps provide K-9 companions for children with disabilities.